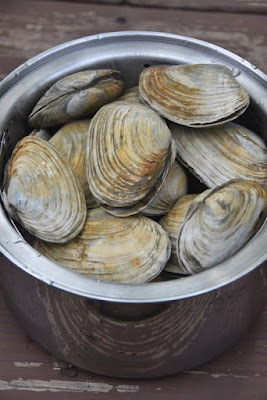 I came across these beautiful Maine steamer clams (also known as soft-shell clams) at my local market. I kept them in their breathable bag and submerged them in water overnight to help remove some sand. Typically in Maine these whole clams are steamed in water until they open up and are served with butter. Instead of butter sometimes I like these steamers dipped in a salt-pepper-lime juice or lemon juice mixture or a Vietnamese dipping sauce called nuoc cham. 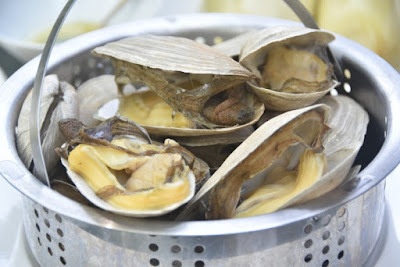 Once the clams are cooked, remove the skin covering the siphon (the clam foot usually seen protruding from the shell). Reserve some clam juice and dip the clam into this to remove any sand before dipping into the butter. This way you will be eating clean and warm clams! 1) Add water on the bottom of the pot, add clams on the steaming rack and turn heat to high. 2) Once the water boils, reduce heat to medium or medium high and let the clams cook about 6 minutes or until they open up. 3) Remove the clams and serve hot with your favorite dipping. *Another way is to boil them if you don't have access to steaming equipment. 1) Heat butter in a small pan over medium low heat until butter is completely melted. 2) Remove from heat and serve immediately. *May also put the butter in the microwave for 15-20 seconds to melt. I learn to cook from experimenting with my ingredients. The more I cook I would like to believe that the better I get. It makes me happy when I can improve on any of my dishes from making them multiple times. Here is an improvement on these steamers. I use a small pot with a steamer basket insert that my mother gave me to steam these clams. I put only 1 cup of water in the pot (1 cup of water makes more flavorful clam broth especially if I want to reserve some for cooking later). Add the insert basket inside. Line the inside with the cleaned steamers (I clean them by letting them soak in cold water for about an hour and rinse them in cold water several times to remove the sand and grit) and cover the pot. The pot does not have to be tightly covered. Turn the heat to high. Once the water starts to boil turn the heat down slightly to medium high. Let the water boil for 5 minutes. Once the 5 minutes are up turn off the heat and let the pot sit on the stove and make your Butter Sauce Dip (recipe above). When the dipping sauce is ready you can eat the clams while they are still hot. I use some of the liquid in the pot to dip my clams in prior to eating. The clam liquid has lots of flavor and dipping them help to remove the extra sand and grit. I save the rest of the clam liquid to cook. Store this liquid (or clam broth) in a container in the refrigerator for a few days or keep it in the freezer for several months. Once you use your own clam liquid for cooking you will never want to buy it again.